Home / Stock Picks / Hot Stocks / Did Digital Realty Stock Just Get Stronger Thanks to Salesforce? Did Digital Realty Stock Just Get Stronger Thanks to Salesforce? Digital Realty Trust (NYSE:DLR) is offering direct, private access to Salesforce’s (NYSE:CRM) platform, the leading CRM solution worldwide, through Digital Realty Service Exchange in 15 metros worldwide. The move comes as part of the company’s effort to grow its business and lure customers, and ultimately boost DLR stock. Particularly, this access to CRM’s platform is being offered in Amsterdam, Ashburn, Atlanta, Boston, Chicago, Frankfurt, Dallas, London and Los Angeles. It is also available with immediate effect in Miami, New York, Phoenix, Portland, San Francisco Bay Area and Seattle. Notably, direct internet access to SaaS applications is beneficial for many businesses and Digital Realty’s Service Exchange offers enterprises a direct connection to IaaS, PaaS and SaaS providers. There are solid advantages because it helps minimize latency and it also enables customers to enhance scalability at a rapid pace, and efficiently from a single cabinet to a multi-megawatt facility. In fact, more than 30% of organizations will connect to cloud providers using alternatives to the public internet, according to a recent Gartner report cited by DLR. This marks a significant increase from 5% reported in third-quarter 2017 and hints at a promising prospect for DLR stock. 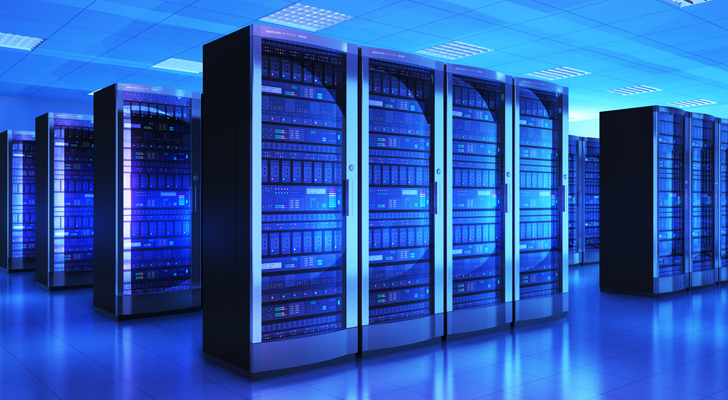 Data center real estate investment trusts will likely continue experiencing a boom market, with growth in cloud computing, Internet of Things and big data and an increasing number of companies opting for third-party IT infrastructure. Also, the estimated growth rates for the artificial intelligence, autonomous vehicle and virtual/augmented reality markets will remain robust over the next five to eight years. All of these elements add to the strength of Digital Realty stock. What’s In Store for DLR Stock? These factors, along with an improved outlook for economic growth, are anticipated to substantially drive growth of data center REITs, including Digital Realty, Equinix (NASDAQ:EQIX), CyrusOne (NASDAQ:CONE), CoreSite Realty (NYSE:COR) and others. Particularly, DLR stock is poised to benefit from this solid demand for data centers through accretive acquisitions and development efforts. The company also focuses on maintaining an investment-grade balance sheet, enjoys ample liquidity and it has a well-laddered debt maturity schedule. Nevertheless, aggressive pricing pressure is likely to continue in the near future. Moreover, the company has a substantial debt burden and hence, the rate hike adds to its woes. Stock in Digital Realty has outperformed the industry it belongs to, in the past three months. Digital Realty stock has gained 13.4%, while the industry has rallied 2.3%. DLR stock currently has a Zacks Rank #3 (Hold). You can see the complete list of today’s Zacks #1 Rank (Strong Buy) stocks here. Zacks names five companies poised to ride a medical breakthrough that is targeting cures for leukemia, AIDS, muscular dystrophy, hemophilia and other conditions. Article printed from InvestorPlace Media, https://investorplace.com/2018/09/did-digital-realty-stock-just-get-stronger-thanks-to-salesforce/.